Get 3X the number of leads and sales from your existing marketing! No hype or gimmicks, automated nurture processes are proven get more homebuyers off of their couches and into your sales center without spending more on advertising. It’s not magic, but it is the ‘secret sauce’ behind the most successful builders, retailers and communities. 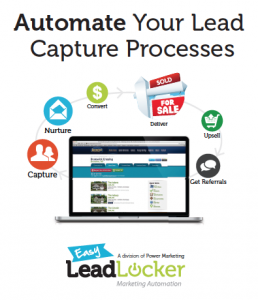 It’s all here in this free download, Automate Your Lead Capture Process, by marketing automation guru, Scott Stroud. Learn how to use ‘lead magnets’, landing pages and automated nurture campaigns to inspire your prospects, earn their trust, and motivate them to take action. Simply complete and submit the brief form below to receive your free report and to see the power of automated nurturing in action! Lead Magnet – A compelling offer that encourages a prospect to register to receive something of value from your website, such as a report, plan series, or other relevant information. Landing Page – An information page on your website that offers specific information and encourages prospects to take further action, such as submit a form or purchase a product. Automated Nurture Campaign – A strategically designed sequence of messages, delivered by email, voice mail or print, designed to educate and motivate buyers to take further action – to call you or come visit your sales center! Marketing Automation – A process of engaging qualified buyers with the right message at the right time, inspiring them to take the right action giving them confidence to buy from you. Marketing automation allows salespeople to spend more of their valuable time in front of qualified buyers instead of ‘tire kickers’. Call 240.420.6343 for a free, no-obligation marketing automation analysis.